I'm never stumped about what to buy the kids, Dave or relatives for the holidays. But gifts for Max's teachers and therapists stump me, mainly because I stand in awe of everything they do for Max and I freeze up on finding the perfect gift. Also, there are 14 of them between Max's teacher, the aides in his class, the therapists at school, and his private therapists. I also drop off a big box of chocolate at the pediatrician's. Ho, ho, uh-oh. 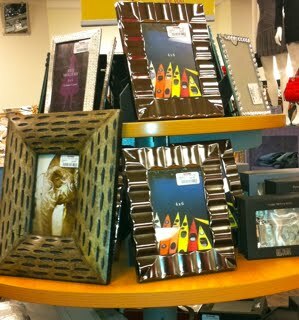 I got some great ideas when I was at a T.J. Maxx event the other day for the store's holiday offerings. What I learned: Every week, T.J. Maxx stores around the country get 10,000 new items (as if you needed more of an excuse to browse). I saw great gifts for everyone on my list, at up to 60 percent off—toys, accessories, jewelry, cologne, you name it. I picked up a few nice scarves for therapists. But I am especially obsessed with the bargain treasures you find in the housewares section (Marshall's, too). 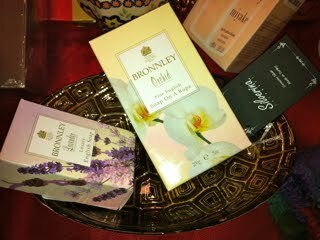 Imported soaps ($4 and $5, which you can tie in ribbon or put in the $7.99 basket). The store's buyers shop around the world, a fine thing since imported anything always seems fancier. I mean, if someone gave me imported toilet paper as a holiday gift I might not be that impressed but maybe, just a little. I'm also going to get Max to draw a picture or write his name in the cards for his teachers and therapists and, as always, tell all of them just how lucky I feel to have them in Max's life. I have in mind the words a teacher once left on this blog: "I really appreciate a heartfelt thank you as much as, if not more than, anything else." I have two $50 T.J. Maxx/Marshalls gift cards to give away. To enter, share: What are you planning to get for your kids' teachers and/or therapists? The giveaway is open until Tuesday, December 13 at 11:59 EST, and is for U.S. residents 18 and older. I will randomly pick the two winners at random.org, alert you by email and announce them here. Note, to enter you must leave your email below if it is not visible on your blog as my ESP is not working. Note, at the event I received a gift bag including a gift card, though I've had a long-time love affair with T.J. Maxx, as my credit card bill can attest. I have a very small budget for things like that...however,in the past I have done several things. Some years I baked an assortment of cookies for each teacher/aide. For several years I put together a small container of essentials--lip balm, hand cream, nail file ( possibly also nail clippers), and a handful of Christmas candy. It wasn't much, but you know it was a unique gift. I am going with hand made ornaments this year. Either beaded candy canes or the applesauce yummy smelling ones. I am going to give them a gift card for a local coffee shop and a special mug. Starting back when my now-3rd grader was in preschool (when her integrated preschool classroom had no less than 5 aides and 2 teachers, not to mention a dedicated SLP and then all of her therapists on top of that), we have made homemade treats for everyone. We used to do just peppermint bark (motor skill practice, hand-eye coordination practice and sensory input - SMASH those candy canes! STIR that chocolate!) and chocolate covered pretzels (ah, the motor planning and coordination workout of using tongs to dip the pretzels into the chocolate!) and in the past few years, we've added truffles (which actually are NOT that hard to make but *seem* like they are) instead of the pretzels. I take pictures of the kiddo while we're making the treats, then include a picture with the label that says "Handmade with love (or "with thanks" depending on the recipient) for you by Kiddo" on the top of the tin. I can usually make 14-16 tins for about $60, thanks to the multi-packs of holiday tins (which are actually plastic) Walmart and Christmas Tree Shop sell every year and the judicious use of the Bulk Foods section of Wegmans (our local grocery store) for the ingredients. From the reactions we've gotten over the years, the candy seems to be a pretty big hit. I follow you on Twitter and my e-mail is betsy0040 at aol dot com. I am a teacher, but I can say what I would want... while handmade things are nice (but never baked goods please! ), we prefer a small gift in gift card form. Even if you can't afford, it's still nice to receive $5-$10 to Starbucks over the lotion set you paid the same amount for. That and a nice card or kid-made item is really always wonderful. I am a teacher and I say, go for something that can be used up. 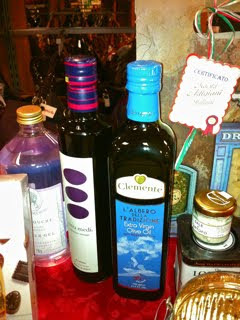 Fancy olive oil or jam or barbeque sauce. Please for the love of God nothing with apples on it. I am always, always stumped about what to get all of my twins' teachers and therapists. This year, there are 26 of them.....and each and every one awes me with what they give to my sons. So, this year, I decided to knit each one a handmade scarf and am also giving their either coffee or tea and a little bit of candy. I asked each one what their favorite color was and knit their scarves in those colors. I also asked if they drink coffee or tea (two of them drink Mt.Dew!) and got some nice specialty coffees and teas. I realized that I can't even begin to make my gift equal what they give my boys, so I just try to do something special and write a note about how much they mean to us. As a SPED Teacher, honestly there's nothing more I love than a simple thank you that my boss hears and passes onto me. Reminding them that I'm doing well at my job when 90% of the time they honestly have no clue because they've never taught SPED goes a long way. As an occupational therapist, I personally feel that a heartfelt note expressing your sentiments is the best gift that you can give! I am a teacher and I love a heartfelt note the most. If you are planning to buy a gift, use the five dollars you would spend on cookie ingredients or candy to get a small gift card. But first and foremost are those sweet notes. This year I'm making reusable snack and sandwich bags for my daughters teachers and therapist and some yummy chex mix. Our entire school body pools its money (whatever individual families can afford to give), and the administrators divide it up and give every teacher, aide, and therapist a monetary gift (an incredibly generous one most years!). In total we have about 20 teachers/therapists/bus aides, etc! I make homemade jam in the summer when berries are in season, and then I give them to all the teachers/therapists at Christmas! I might get ambitious and make molasses cookies or homemade baguettes to go with them. I also usually get a gift card or gift for the classrooms - Target or bookstore - my husband is a teacher too and I know how much $$ he spends on classroom stuff! I usually give gift cards to Barnes and Noble to our 2 teachers, but this year our number of recipients has grown by leaps and bounds. I plan on using Nordstrom Rewards I've earned to give all 10 ladies on our list butter socks and the one gentleman, lip balm from Jack Black. This way I don't spend any money and I get them something a bit different. I have, like a previous poster said, used the coupons to stack up at bath and body works. I don't do lotions, because not everyone uses lotion. Everyone washes their hands though, and I love the kitchen soaps they have there. I also make sure to always include a gift receipt in case they don't like the scent. I throw in a $5 star bucks card or wal mart card generally as well. I am also a love that max follower on facebook! I make a donation to Love Without Boundaries' education fund. Chinese orphans get to go to school, the teacher gets a nice card. Everyone is happy. ...and I like you on Facebook. Great ideas. Our budget is usually very limited for these things as we have so many people to buy for, but this year I splurged a little on two therapists who have worked with our son for the past couple years. I bought them both t-shirts from www.3elove.com. They have an occupation line and a proud line that are both very cool. I bought the Love shirts with physical therapy and occupational therapy written under them. I wanted to share because I think you would really enjoy their website and products. My email is tojumiel(at)yahoo(dot)com. I also follow on Facebook and Twitter. I am an Early Interventionist so I am coming from the receiving end of this... Recently I had twin girls graduate out of the program and they gave me a pair of earrings. I love this idea because everytime I put them on I think of the girls. Same goes for pens- since I use them constantly to write up reports all day- I think of the sweet kiddo who gave me my funny light up pen or my oh so cute Mickey pen. My absolute favorite gift is a photo of the student with their name written on the back- love! I'm amazed at all the comments on here. They give me some good ideas. The $5 gift card/person still seems out of our reach financially. There are just too many people! For my typically developing daughter, I donated some books from the school book fair to the room. For my special needs child, we are making the fixings for an individual cup cake and adding them to a mug along with directions on how to make them in the microwave - found the idea at familyfun.com and I hope they like it! I'm a little worried because of all the comments from the teachers that they don't want baked goods. Gift cards for all, I am not creative, and cannot cook... Follow you via Facebook. My boys' school have a holiday fund which is great for me because I used to do gift cards and so it is easier this way. We are still doing that but this year, one of my kids' classes is making a very personalized holiday cookbook for all (six) teachers in the classroom. We have a great class parent organizing it. I am still thinking about doing something special just for the head teacher. I know that baking is her hobby so maybe something from Williams Sonoma. For the others, it might be something like the things you suggested in your post. As a therapist we love the genuine heartfelt words written in a card, note or letter to us or better to our boss that trickles its way to is. What perspective to read how others feel an think of you. Greatest gift. Last year, I gave out nice hand cream and our holiday photo card with a thank you note on the back. Glad to hear that therapists like the heartfelt thanks...I think that's all that in the budget this year. I'd like to get gift baskets (food, h&b products) to them. i used to think our eight teachers between the two kids was a lot, until i saw you had 13! A couple years ago, I learned to decopage, so I did a plate and then filled it with cookies. Earlier this year, I lucked into some really cheap crystal light in the plastic tubes. I took the labels off. I am going to cover them with some cute holiday paper and put a little thank you label on. Then I am going to fill them with peppermint patties. We are doing dinner baskets. Soup in a jar. Cornbread mix in a jar. Chunky cookie mix in a jar. And then for the finale, we are making Hot Chocolate Mixers. Candy canes with a marshmallow on the end- dipped in chocolate. Wrap it all up in a sweet basket with a cute tag! I buy plastic totes when they're on sale and personalize with the teacher/therapists name in vinyl. Everyone can use a plastic tote to put stuff in. We make cookies for the teachers, aides and bus drivers. We are making an ornament and giving them some fuzzy socks and coffee and chocolate, a favorite of mine, and hopefully theirs! I'm a teacher, and the best gift I can get is a picture of the kids. I have a bulletin board in my room of all the photos I've received over the years as well as art work. I plan to buy the teachers Starbucks gift cards. I love making gift sets, a very nice one is an Italian themed basket. This can include things such as: Olive oil (and herbs for dipping, although you can buy a bread dip), a crusty loaf of bread (if giving soon), specialty pasta, pasta sauce, etc..
We are getting my son's teacher a Yoga mat, he promotes this exercise everyday in his class. Like the other teachers and therapists, a kind note from you and your child is the best gift! I usually save mine...many of us do! If you must give a gift, a $5 dollar gift card to a coffee shop/cafe is great! Working with your child is one of our greatest gifts! For what it's worth, I have a lot of friends who are teachers and they get a lot of mugs and candles and soaps and olive oils and stuff. Most of those items get re-gifted (with love!). The stuff that gets held on to is the thank you notes. One of my friends has a bunch of thank you notes pinned to a wall in her house. They mean so much to her, and inspire her when she's dealing with more of the shenanigans teachers have to deal with (pay cuts, increases in hours, pension cuts, unexpected layoffs, etc). We are doing a gift card for a local coffee hop/gift store and a fun Christmas ornament. My 7 year old son has an amazing teacher this year who has really done a lot to boost his confidence and encourage him to develop the things he is good at, and he has written her a heartfelt note/picture telling her how special she is. I got my son's therapists a ceramic pot with a bulb planted inside, and then put a nice home-made card saying "thank you for helping me grow" - did this last year and it was a big hit. as a therapist, I have to say that I cherish notes from family or pictures that the kids have drawn. And truly, we hardly ever get anything, so to give something like that is very meaningful and we'll definitely hold onto it. We enjoy sharing goodies in the office if you like to bake. I get super excited by dollar store items, so if you find good sensory toys in a dollar bin that's a bonus too. But no therapist expects you to get them anything, especially if it has a cost. After a few years of the "coffee beans and mug" or the holiday ornament, I'm giving both teachers gas cards. Both are young. One has a long commute. I have a cookie cutter that is a hand shape with a heart cut out in the middle. We get FIMO dough or whatever and Darsie gets to roll out the dough and cut and then cut a heart to press into it. She gets some therapy, the teachers/therapists get something that they can hang somewhere year round. I'm also big fans of starbuck or coffee shop gift cards. Or, if I'm feeling generous, manicure or pedicure gift certificates. This is what I did for teacher/therapist gifts this year: http://motherhoodandotheradventures.wordpress.com/2011/12/14/tasty-tuesday-peppermint-bark/ It was fairly easy and everyone loved it! I have always given homemade gifts. Decorations that could be used for home of school. I make stained glass, so that is usually the main thing I gift. The easything to do now a days is gift cards. My mom is a school nurse and always getting gifts she doesn't want/can't use. Somehow it always seems that the kids with the filthiest hands are the ones that come in with baked goods proclaiming- "I helped make them!" Those went right in the trash. My mom always appreciated gift cards to places like TJ Maxx, Marshalls, Dunkin Donuts (especially Dunkin Donuts!). So, being the recipient of so many unwanted gifts, she always sent me to school with stationary/thank you note cards to give my teachers- knowing that the teachers would use them. And often, I got one of them written to me as a thank you for my useful gift! I am doing a nice candle (coincidentally already purchased from tj maxx), a mini loaf of cranberry bread and a 10 Starbucks card. Cheryl's cookies, they are the best and calories around the holidays don't count! Bake madeleines (or any other yummy treat) and pair with coffee or hot chocolate. Depending on teacher's interests, sometimes I find an appropriate and interesting book - paired with chocolates. I am a Mary Kay consultant so I get all of my products at 50% off - this enables me to give great, high retail gifts to all of the teachers, therapists, etc at only a wholesale price! Love it! I "Like" Love That Max on Facebook. I'm a manicurist so my Christmas gift for all of Ava's therapists was a free manicure. Next year though, I'll get them a box of cookies.